1 A None No Power Seat 1 A is a standard Business Class seat located at a bulkhead that transforms to a fully flat bad. The proximity to the galley and lavatory area might be bothersome. 1 D None No Power Seat 1 D is a standard Business Class seat located at a bulkhead that transforms to a fully flat bad. The proximity to the galley and lavatory area might be bothersome. 1 F None No Power Seat 1 F is a standard Business Class seat located at a bulkhead that transforms to a fully flat bad. The proximity to the galley and lavatory area might be bothersome. 1 J None No Power Seat 1 J is a standard Business Class seat located at a bulkhead that transforms to a fully flat bad. The proximity to the galley and lavatory area might be bothersome. 10 A None No Power Seat 10 A is a standard Business Class seat that transforms into a fully flat bed. 10 D None No Power Seat 10 D is a standard Business Class seat that transforms into a fully flat bed. 10 F None No Power Seat 10 F is a standard Business Class seat that transforms into a fully flat bed. 10 J None No Power Seat 10 J is a standard Business Class seat that transforms into a fully flat bed. 12 A None No Power Seat 12 A is a standard AM Plus Class seat that may have extra legroom. Aeromexico classifies this seat as "AM Plus" which provides an additional 4 inches of legroom for an additional fee. The tray table and the inflight entertainment monitor are in the armrest, making the armrest immovable and slightly reducing seat width. There may be no floor storage during take-off and landing. Passengers traveling with infants are often seated here as there are bassinets located in this row. 12 B None No Power Seat 12 B is a standard AM Plus Class seat that may have extra legroom. Aeromexico classifies this seat as "AM Plus" which provides an additional 4 inches of legroom for an additional fee. The tray table and the inflight entertainment monitor are in the armrest, making the armrest immovable and slightly reducing seat width. There may be no floor storage during take-off and landing. Passengers traveling with infants are often seated here as there are bassinets located in this row. 12 C None No Power Seat 12 C is a standard AM Plus Class seat that may have extra legroom. Aeromexico classifies this seat as "AM Plus" which provides an additional 4 inches of legroom for an additional fee. The tray table and the inflight entertainment monitor are in the armrest, making the armrest immovable and slightly reducing seat width. There may be no floor storage during take-off and landing. Passengers traveling with infants are often seated here as there are bassinets located in this row. 12 D None No Power Seat 12 D is a standard AM Plus Class seat that may have extra legroom. Aeromexico classifies this seat as "AM Plus" which provides an additional 4 inches of legroom for an additional fee. The tray table and the inflight entertainment monitor are in the armrest, making the armrest immovable and slightly reducing seat width. There may be no floor storage during take-off and landing. Passengers traveling with infants are often seated here as there are bassinets located in this row. 12 E None No Power Seat 12 E is a standard AM Plus Class seat that may have extra legroom. Aeromexico classifies this seat as "AM Plus" which provides an additional 4 inches of legroom for an additional fee. The tray table and the inflight entertainment monitor are in the armrest, making the armrest immovable and slightly reducing seat width. There may be no floor storage during take-off and landing. Passengers traveling with infants are often seated here as there are bassinets located in this row. 12 F None No Power Seat 12 F is a standard AM Plus Class seat that may have extra legroom. Aeromexico classifies this seat as "AM Plus" which provides an additional 4 inches of legroom for an additional fee. The tray table and the inflight entertainment monitor are in the armrest, making the armrest immovable and slightly reducing seat width. There may be no floor storage during take-off and landing. Passengers traveling with infants are often seated here as there are bassinets located in this row. 12 G None No Power Seat 12 G is a standard AM Plus Class seat that may have extra legroom. Aeromexico classifies this seat as "AM Plus" which provides an additional 4 inches of legroom for an additional fee. The tray table and the inflight entertainment monitor are in the armrest, making the armrest immovable and slightly reducing seat width. There may be no floor storage during take-off and landing. Passengers traveling with infants are often seated here as there are bassinets located in this row. 12 H None No Power Seat 12 H is a standard AM Plus Class seat that may have extra legroom. Aeromexico classifies this seat as "AM Plus" which provides an additional 4 inches of legroom for an additional fee. The tray table and the inflight entertainment monitor are in the armrest, making the armrest immovable and slightly reducing seat width. There may be no floor storage during take-off and landing. Passengers traveling with infants are often seated here as there are bassinets located in this row. 12 J None No Power Seat 12 J is a standard AM Plus Class seat that may have extra legroom. Aeromexico classifies this seat as "AM Plus" which provides an additional 4 inches of legroom for an additional fee. The tray table and the inflight entertainment monitor are in the armrest, making the armrest immovable and slightly reducing seat width. There may be no floor storage during take-off and landing. Passengers traveling with infants are often seated here as there are bassinets located in this row. 14 A None No Power Seat 14 A is a standard AM Plus Class seat that may have extra legroom. Aeromexico classifies this seat as "AM Plus" which provides an additional 4 inches of legroom for an additional fee. 14 B None No Power Seat 14 B is a standard AM Plus Class seat that may have extra legroom. Aeromexico classifies this seat as "AM Plus" which provides an additional 4 inches of legroom for an additional fee. 14 C None No Power Seat 14 C is a standard AM Plus Class seat that may have extra legroom. Aeromexico classifies this seat as "AM Plus" which provides an additional 4 inches of legroom for an additional fee. 14 D None No Power Seat 14 D is a standard AM Plus Class seat that may have extra legroom. Aeromexico classifies this seat as "AM Plus" which provides an additional 4 inches of legroom for an additional fee. 14 E None No Power Seat 14 E is a standard AM Plus Class seat that may have extra legroom. Aeromexico classifies this seat as "AM Plus" which provides an additional 4 inches of legroom for an additional fee. 14 F None No Power Seat 14 F is a standard AM Plus Class seat that may have extra legroom. Aeromexico classifies this seat as "AM Plus" which provides an additional 4 inches of legroom for an additional fee. 14 G None No Power Seat 14 G is a standard AM Plus Class seat that may have extra legroom. Aeromexico classifies this seat as "AM Plus" which provides an additional 4 inches of legroom for an additional fee. 14 H None No Power Seat 14 H is a standard AM Plus Class seat that may have extra legroom. Aeromexico classifies this seat as "AM Plus" which provides an additional 4 inches of legroom for an additional fee. 14 J None No Power Seat 14 J is a standard AM Plus Class seat that may have extra legroom. Aeromexico classifies this seat as "AM Plus" which provides an additional 4 inches of legroom for an additional fee. 15 A None No Power Seat 15 A is a standard AM Plus Class seat that may have extra legroom. Aeromexico classifies this seat as "AM Plus" which provides an additional 4 inches of legroom for an additional fee. 15 B None No Power Seat 15 B is a standard AM Plus Class seat that may have extra legroom. Aeromexico classifies this seat as "AM Plus" which provides an additional 4 inches of legroom for an additional fee. 15 C None No Power Seat 15 C is a standard AM Plus Class seat that may have extra legroom. Aeromexico classifies this seat as "AM Plus" which provides an additional 4 inches of legroom for an additional fee. 15 D None No Power Seat 15 D is a standard AM Plus Class seat that may have extra legroom. Aeromexico classifies this seat as "AM Plus" which provides an additional 4 inches of legroom for an additional fee. 15 E None No Power Seat 15 E is a standard AM Plus Class seat that may have extra legroom. Aeromexico classifies this seat as "AM Plus" which provides an additional 4 inches of legroom for an additional fee. 15 F None No Power Seat 15 F is a standard AM Plus Class seat that may have extra legroom. Aeromexico classifies this seat as "AM Plus" which provides an additional 4 inches of legroom for an additional fee. 15 G None No Power Seat 15 G is a standard AM Plus Class seat that may have extra legroom. Aeromexico classifies this seat as "AM Plus" which provides an additional 4 inches of legroom for an additional fee. 15 H None No Power Seat 15 H is a standard AM Plus Class seat that may have extra legroom. Aeromexico classifies this seat as "AM Plus" which provides an additional 4 inches of legroom for an additional fee. 15 J None No Power Seat 15 J is a standard AM Plus Class seat that may have extra legroom. Aeromexico classifies this seat as "AM Plus" which provides an additional 4 inches of legroom for an additional fee. 2 A None No Power Seat 2 A is a standard Business Class seat that transforms into a fully flat bed. 2 D None No Power Seat 2 D is a standard Business Class seat that transforms into a fully flat bed. 2 F None No Power Seat 2 F is a standard Business Class seat that transforms into a fully flat bed. 2 J None No Power Seat 2 J is a standard Business Class seat that transforms into a fully flat bed. 24 D None No Power Seat 24 D is a standard Economy Class seat that has limited recline and whose proximity to the lavatory may be bothersome. 24 E None No Power Seat 24 E is a standard Economy Class seat that has limited recline and whose proximity to the lavatory may be bothersome. 24 F None No Power Seat 24 F is a standard Economy Class seat that has limited recline and whose proximity to the lavatory may be bothersome. 25 A None No Power Seat 25 A is a standard Economy Class seat that has limited recline and whose proximity to the lavatory may be bothersome. 25 B None No Power Seat 25 B is a standard Economy Class seat that has limited recline and whose proximity to the lavatory may be bothersome. 25 C None No Power Seat 25 C is a standard Economy Class seat that has limited recline and whose proximity to the lavatory may be bothersome. 25 G None No Power Seat 25 G is a standard Economy Class seat that has limited recline and whose proximity to the lavatory may be bothersome. 25 H None No Power Seat 25 H is a standard Economy Class seat that has limited recline and whose proximity to the lavatory may be bothersome. 25 J None No Power Seat 25 J is a standard Economy Class seat that has limited recline and whose proximity to the lavatory may be bothersome. 26 A None No Power Seat 26 A is a standard Economy Class seat that has additional legroom due to the Exit Row, however, the Exit Door protrusion may be bothersome. The proximity to the lavatories and galley may be bothersome. The tray table and the inflight entertainment monitor are in the armrest, making the armrest immovable and slightly reducing seat width. There may be no floor storage during take-off and landing. Aeromexico classifies this seat as a "Preferred Seat." Selection of this seat is available for an additional fee. 26 B None No Power Seat 26 B is a standard Economy Class seat that has additional legroom due to the Exit Row. The tray table and inflight entertainment monitor are in the armrest, making the armrest immovable and slightly reducing seat width. There may be no floor storage during take-off and landing. Aeromexico classifies this seat as a "Preferred Seat." Selection of this seat is available for an additional fee. 26 C None No Power Seat 26 C is a standard Economy Class seat that has additional legroom due to the Exit Row. The tray table and inflight entertainment monitor are in the armrest, making the armrest immovable and slightly reducing seat width. There may be no floor storage during take-off and landing. Aeromexico classifies this seat as a "Preferred Seat." Selection of this seat is available for an additional fee. 26 G None No Power Seat 26 G is a standard Economy Class seat that has additional legroom due to the Exit Row. The tray table and inflight entertainment monitor are in the armrest, making the armrest immovable and slightly reducing seat width. There may be no floor storage during take-off and landing. Aeromexico classifies this seat as a "Preferred Seat." Selection of this seat is available for an additional fee. 26 H None No Power Seat 26 H is a standard Economy Class seat that has additional legroom due to the Exit Row. The tray table and inflight entertainment monitor are in the armrest, making the armrest immovable and slightly reducing seat width. There may be no floor storage during take-off and landing. Aeromexico classifies this seat as a "Preferred Seat." Selection of this seat is available for an additional fee. 26 J None No Power Seat 26 J is a standard Economy Class seat that has additional legroom due to the Exit Row, however, the Exit Door protrusion may be bothersome. The proximity to the lavatories and galley may be bothersome. The tray table and the inflight entertainment monitor are in the armrest, making the armrest immovable and slightly reducing seat width. There may be no floor storage during take-off and landing. Aeromexico classifies this seat as a "Preferred Seat." Selection of this seat is available for an additional fee. 27 D None No Power Seat 27 D is a standard Economy Class seat with additional legroom, however, the proximity to the galley may be bothersome. The tray table and inflight entertainment monitor are installed in the armrest making the armrest immovable, therefore, slightly reducing seat width. 27 E None No Power Seat 27 E is a standard Economy Class seat with additional legroom, however, the proximity to the galley may be bothersome. 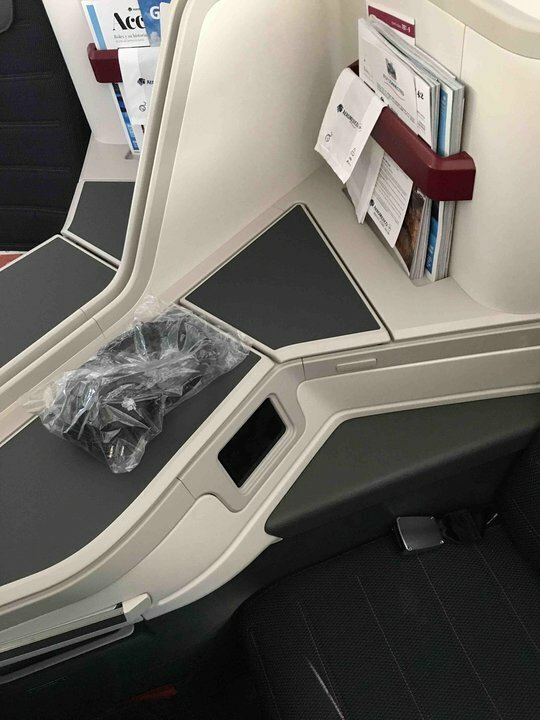 The tray table and inflight entertainment monitor are installed in the armrest making the armrest immovable, therefore, slightly reducing seat width. 27 F None No Power Seat 27 F is a standard Economy Class seat with additional legroom, however, the proximity to the galley may be bothersome. The tray table and inflight entertainment monitor are installed in the armrest making the armrest immovable, therefore, slightly reducing seat width. 3 A None No Power Seat 3 A is a standard Business Class seat that transforms into a fully flat bed. 3 D None No Power Seat 3 D is a standard Business Class seat that transforms into a fully flat bed. 3 F None No Power Seat 3 F is a standard Business Class seat that transforms into a fully flat bed. 3 J None No Power Seat 3 J is a standard Business Class seat that transforms into a fully flat bed. 37 A None No Power Seat 37 A is a standard Economy Class seat that is missing a window. 37 J None No Power Seat 37 J is a standard Economy Class seat that is missing a window. 39 A None No Power Seat 39 A is a standard Economy Class seat in the last row of this plane and has limited recline. The proximity to the lavatory and galley may be bothersome. 39 B None No Power Seat 39 B is a standard Economy Class seat in the last row of this plane and has limited recline. The proximity to the lavatory and galley may be bothersome. 39 C None No Power Seat 39 C is a standard Economy Class seat in the last row of this plane and has limited recline. The proximity to the lavatory and galley may be bothersome. 39 D None No Power Seat 39 D is a standard Economy Class seat whose proximity to the lavatory may be bothersome. 39 F None No Power Seat 39 F is a standard Economy Class seat whose proximity to the lavatory may be bothersome. 39 J None No Power Seat 39 J is a standard Economy Class seat in the last row of this plane and has limited recline. The proximity to the lavatory and galley may be bothersome. 4 A None No Power Seat 4 A is a standard Business Class seat that transforms into a fully flat bed. 4 D None No Power Seat 4 D is a standard Business Class seat that transforms into a fully flat bed. 4 F None No Power Seat 4 F is a standard Business Class seat that transforms into a fully flat bed. 4 J None No Power Seat 4 J is a standard Business Class seat that transforms into a fully flat bed. 40 D None No Power Seat 40 D is a standard Economy Class seat in the last row of this plane and has limited recline. The proximity to the lavatory and galley may be bothersome. 40 E None No Power Seat 40 E is a standard Economy Class seat in the last row of this plane and has limited recline. The proximity to the lavatory and galley may be bothersome. 40 F None No Power Seat 40 F is a standard Economy Class seat in the last row of this plane and has limited recline. The proximity to the lavatory and galley may be bothersome. 5 A None No Power Seat 5 A is a standard Business Class seat that transforms into a fully flat bed. 5 D None No Power Seat 5 D is a standard Business Class seat that transforms into a fully flat bed. 5 F None No Power Seat 5 F is a standard Business Class seat that transforms into a fully flat bed. 5 J None No Power Seat 5 J is a standard Business Class seat that transforms into a fully flat bed. 6 A None No Power Seat 6 A is a standard Business Class seat that transforms into a fully flat bed. 6 D None No Power Seat 6 D is a standard Business Class seat that transforms into a fully flat bed. 6 F None No Power Seat 6 F is a standard Business Class seat that transforms into a fully flat bed. 6 J None No Power Seat 6 J is a standard Business Class seat that transforms into a fully flat bed. 7 A None No Power Seat 7 A is a standard Business Class seat that transforms into a fully flat bed. 7 D None No Power Seat 7 D is a standard Business Class seat that transforms into a fully flat bed. The proximity to the self serve bar may be bothersome. 7 F None No Power Seat 7 F is a standard Business Class seat that transforms into a fully flat bed. The proximity to the self serve bar may be bothersome. 7 J None No Power Seat 7 J is a standard Business Class seat that transforms into a fully flat bed. 8 A None No Power Seat 8 A is a standard Business Class seat that transforms into a fully flat bed. The proximity to the self serve bar may be bothersome. 8 J None No Power Seat 8 J is a standard Business Class seat that transforms into a fully flat bed. The proximity to the self serve bar may be bothersome. 9 D None No Power Seat 9 D is a standard Business Class seat that transforms into a fully flat bed. The proximity to the lavatories and the self serve bar may be bothersome. 9 F None No Power Seat 9 F is a standard Business Class seat that transforms into a fully flat bed. The proximity to the lavatories and the self serve bar may be bothersome. The onboard IFE system in both Clase Premier Business and Main Cabin Economy Classes features a Jukebox application that allows passengers to program playlists with a choice of 1,500 songs and iConnect for iPod synching. 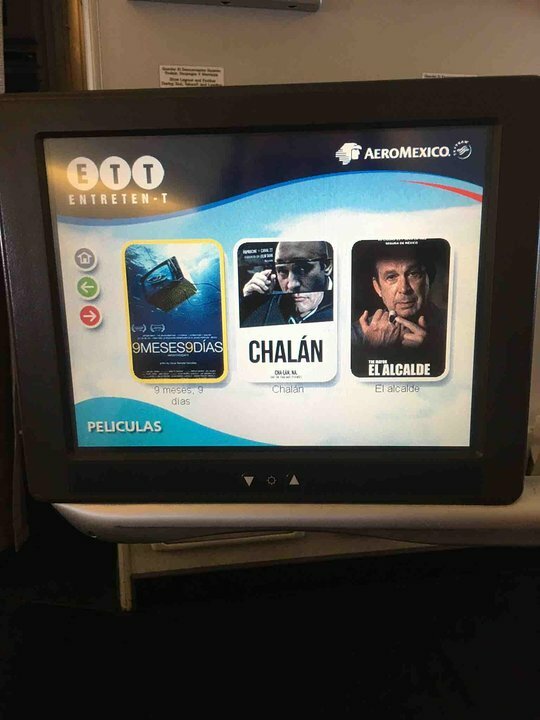 Clase Premier features personal 16" Elite Panasonic HD IFE systems. Passengers may watch movies and TV shows on demand. Real-time moving maps may also be viewed. Passengers may also use the seat chat function to communicate with other passengers onboard the aircraft. In Main Cabin, passengers have Eco Monitor Touch screens at each seat. Over 20 films and 36 television series may be selected for viewing. Main Cabin IFE also features real time moving maps and the onboard seat chat communication. Each Clase Premier Business seat has a 110v AC power port. USB power ports are at every seat in Clase Premier and Main Cabin. Aeromexico provides Wi-Fi access to the internet via Gogo. Various programs may be viewed and purchased in advance by accessing gogoair.com. Aeromexico offers a variety of meal options, hot and cold beverages, as well as complimentary alcoholic beverages. Special meals may be requested at least 24 hours in advance of the flight. Contact the Aeromexico Call Center via telephone at +1 800 237 6639 (USA) or +01 800 021 4010 (Mexico) to make arrangements. 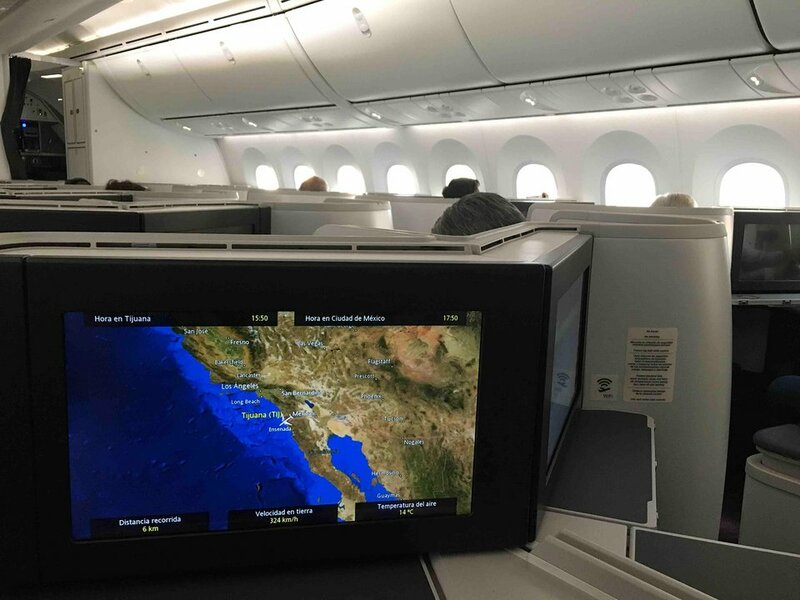 The Aeromexico Boeing 787-9 Dreamliner flies in a two class configuration with 6 abreast seating in Clase Premier Business Class and 9 abreast seating in Main Cabin Economy Class. Seating in Main Cabin is further divided into AM Plus, offering additional legroom plus priority check-in, boarding, and baggage handling (for an additional fee), Preferred, offering seating near the front of the aircraft or Exit Rows (for an additional fee), and standard. Very good seat, much better than the ones used in the 787-8 (1-2-1 vs 2-2-2). Very private feeling. The emergency door doesn't let you stretch your right foot as you would wish. 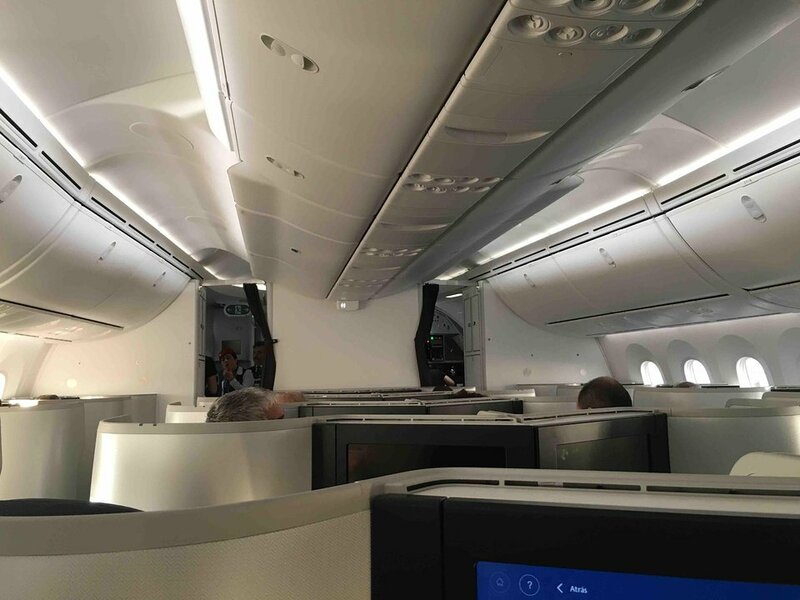 By far the most comfortable biz class that aeromeixco has to offer, although they only have 6 of these planes, and its very possible your 787-9 will get switched out for 787-8 last minute. The seats are very soft and offer 100% privacy in the configuration with direct aisle access for everyone. Soft product is typical aeromexico. I took the once daily flight from MEX to JFK and slept like a baby. Take this plane if you can. Row 26 has great space for legs but the seats are narrow because the service table is in the armrest and the window seats only have half window looking back, so there is no real view from that seat. Also during flight many people can be there because of the bathrooms and galley so can be difficult to sleep. Row 37 has no window because is in the union of the two pieces of fuselage. 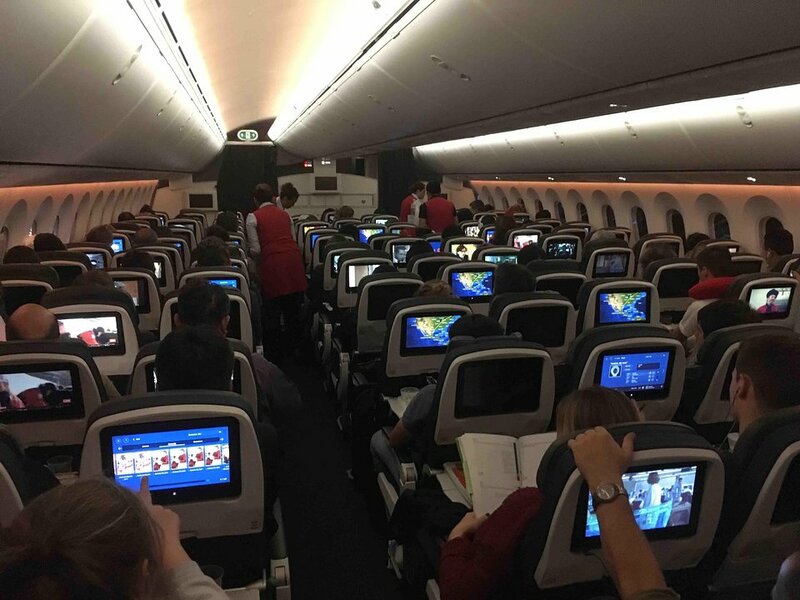 Row 39, as in the -8, have two seats in each side, "A" and "C" in the left side (not 3 seats) and "G" and "J" int the left side, and both rows 38 and 39 on the right side are reserved for cabin crew rest in longhaul flights so passengers can't book them. The proximity to economy class is bothersome. Infant seats behind and therefore a lot of noise from behind. The food service starts from the front backwards and you don't usually get the meal of your choice. Excellent business class seat. Im 6'3 (About 1.92 m) and the seat was very confortable. This is a very good business class product. Aeromexico flies 1 versions of Boeing 787-9 (789).